Health Costs > How Much Does a Lumbar MRI Cost? How Much Does a Lumbar MRI Cost? An MRI, or magnetic resonance imaging, is a painless, non-invasive, and safe medical procedure that helps physicians identify and treat medical conditions. It uses a powerful magnetic field and radio waves to come up with a detailed three-dimensional picture of the lumbar spine, which includes the disks, bones, and almost all other internal body structures. Unlike a CAT scan or CT scan, an MRI does not use radiation. Sometimes, an MRI is conducted to evaluate the anatomy of the lumbar spine to serve as a guide in the planning for surgery on the spine or to observe the changes in the spine after an operation. A lumbar MRI may also be used to determine the problem with the back in the first place. A lumbar spine MRI is helpful when analyzing lower back pain, leg pain, leg tingling, a lower spine injury, signs of cancer or prior to a lower back surgery procedure. The costs of a lumbar MRI will depend on the hospital/facility, geographical location, if the contrast is needed and if insurance is included. 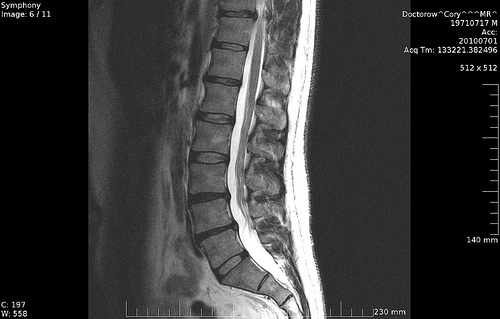 On average, a lumbar spine MRI is going to cost $500 to $3,000+ without insurance. However, if you have a health insurance policy, it should be covered. Be sure to check with your provider to know exactly what your policy is going to be covered. Those who either want a new policy or are looking for a new one, consider browsing through hundreds of policies for free at eHealthInsurance.com. NOTE: These are prices for those who don’t have insurance and no contrast is involved. The Healthcare Bluebook, for example, says the average spine MRI, without contrast, can cost $513 to $1,605. On this Spine-Health.com forum thread, someone asked what they should expect to pay for a lumbar MRI. According to those who responded, one person was billed $897, while another was billed $3,200 for the MRI and another $823 for the contrast. Those who had insurance had paid anywhere from $300 to $900. Prior to the scan, you will be asked to remove any metal objects. Then, you will lie on a moveable table that slides into the tunnel where the MRI takes place. If contrast dye were being used, the doctor will inject it via a tube that’s inserted into one of your veins. If this were the case, you may have to wait up to one hour to allow the contrast to work its way through your bloodstream. The scan will take 30 to 60 minutes but could take longer depending on the positioning required. A lumbar MRI will be able to evaluate the cervical bones, muscle, tissue, spinal cord and the lower brain. It can detect fractures, bone infections, tumors, bulges, disc flattening and if there’s any blockage inside the spinal canal. After the procedure, you’re free to go home, but if you did take a sedative, then you will have to bring someone along to help you get home. As for the images, it may take a few hours if the facility was using film, but in most cases, a computer will be used, which in this case, the results can be seen immediately. It can take up to a week to receive your results. When available, your doctor will call you to discuss your results either over the phone or in person. An MRI with contrast will cost up to 30 percent more than one without it. If you feel claustrophobic or have anxiety before the procedure, then you may be prescribed a mild sedative, which can cost another $150 to $350. The radiologist’s fee is often not included in the above prices. If you need a reading by a radiologist, this could be another $100 to $200. The cost of the MRI does not include the cost of the initial visit to the doctor who ordered the MRI. Based on the findings of the MRI scan, the physician may issue prescriptions, which are not included in the cost of the MRI examination itself. You may also need more treatment in the future depending on the results found. Some clinics or treatment centers use an open MRI machine with large openings to keep claustrophobic patients comfortable. If you feel claustrophobic in tighter spaces, then you may want to find a center that uses this type of machine. The risks, as mentioned by HealthLine.com, are rare, but they do occur. For example, an MRI can result in problems if you had a pacemaker and/or implanted screws. Another reaction may be due to the contrast dye. During some scans, people may find themselves allergic to the contrast. For those who don’t have a health insurance policy, be sure to ask about cash discounts or financing options. In some cases, you could save as much as $500 if you were to pay all of it in full. Always choose a freestanding facility instead of a hospital as this option will always save you hundreds of dollars. Most centers will be more than happy to offer you a quote over the phone or even on its website, so it doesn’t hurt to get as many quotes as possible. I was charged by Inland imaging who then charged my Medicare and now I am also being charged by the hospital who did nothing but check me in and the hospital is charging me $2298 and I was only charged $1900 by Inland imaging so I’m trying to figure out how they can both charge me and both charge Medicare when only Inland imaging did the scan in one of their mobile units that they bring up to Newport once a week.